A 50th anniversary, whether it marks a birth, a marriage or a graduation year, is a special milestone. It provides an opportunity to pause and reflect upon the events that have helped shape the lives of individuals and groups, even of societies themselves. That’s why scores of alumni, current students, faculty, staff and AU friends gathered during the 2017 Homecoming Weekend to witness the dedication of the university’s new labyrinth, a gift from the Class of 1967, which celebrated its 50th reunion this year. 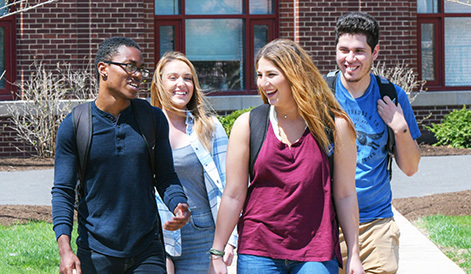 “As a class we felt that we needed to give something back to the university in appreciation of everything the institution has given us,” said John Fenlason ’67, a member of the class committee that helped plan the reunion and coordinate the fundraising effort. “Our class gift is intended not only to give witness to our brief time here but also to build on the university’s timeless values of character and scholarship,” he said. Forty feet in circumference and made of thousands of individually sized brown and red concrete pavers, the labyrinth nestles amid the trees near the southwest corner of Aurora’s main campus at Prairie Street and South Evanslawn Avenue. The location is appropriate — quiet and accessible yet spatially related to the Wackerlin Center for Faith and Action, itself devoted to cultivating the religious and spiritual life of AU students. Labyrinths long have been symbols of life’s journey. The builders of the great cathedrals at Chartres, Reims and Amiens relied upon this imagery to communicate their Christian message. Labyrinths remind us that paths are rarely straight. They twist and turn, challenging the faithful traveler to retrace, reflect and set off anew in pursuit of Truth. Class gifts are a time-honored tradition at Aurora University. Various classes have contributed special landscaping and benches that adorn campus, and alumni from three classes helped raise the $600,000 necessary to purchase the hand-built, 1,230-pipe Opus 119 organ now in Crimi Auditorium. Most recently, the Class of 1965 raised $100,000 to name the living room in the Hill Welcome Center. 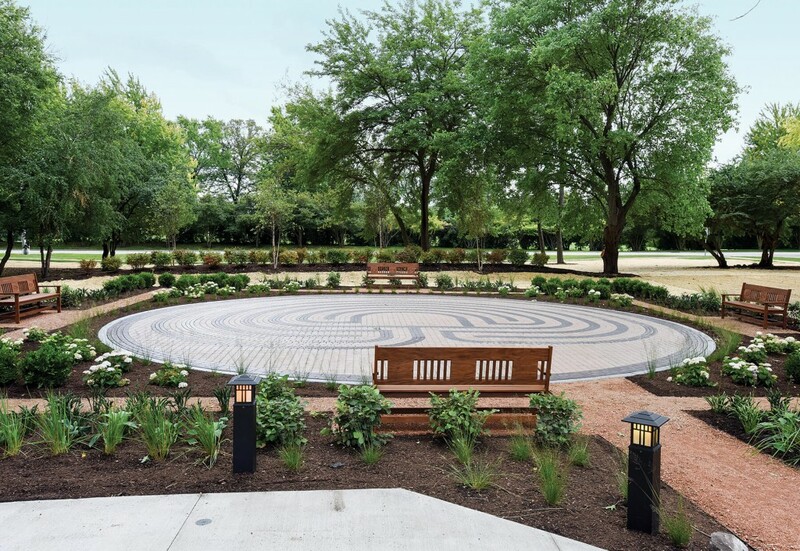 According to Fenlason, almost 60 members of the Class of 1967 rallied in support of the labyrinth, raising more than $50,000 in just three years.